This product shows the trends in abundance of fish species (cod, plaice, herring, anchovy, sandeel, mackerel, sprot) in the North Sea. 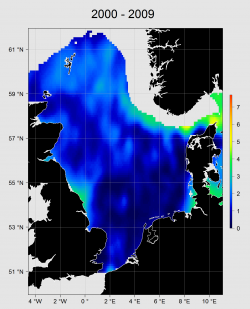 Data from the IBTS shows clearly the dramatic stock depletion of the last decades in the North Sea. Since the beginning of the 1990s, there has been a change in the relative distribution of Pleuronectes platessa in the North Sea. The abundances have increased in deeper, more offshore areas, while coastal abundances have been stagnant or declining. These trends reported in literature can be clearly observed in the data products. 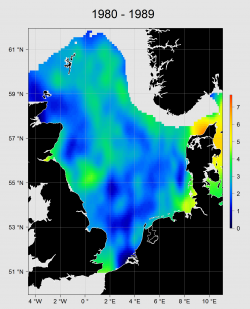 The map shows how this species became more abundant the last decades in the North Sea. 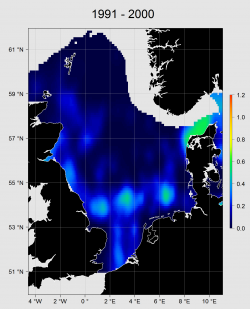 This confirms reported trends indicating that abundance and spatial occupation of European anchovy Engraulis encrasicolus have increased in the North Sea since the mid-1990s.